How should we scale Scrum beyond individual projects? How can PMOs avoid being process police and instead truly support Scrum teams, enable enterprise rollout of Scrum, and sustain long-term Scrum adoption? 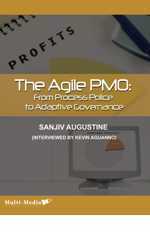 Sanjiv will share principles and techniques for the Agile PMO, and discuss how those concepts are being applied in the industry to scale Scrum through adaptive governance of programs and portfolios. Learn how to make the most out of your agile transformation by leveraging an agile PMO.